(Paris) The European Union (EU) must demand the Lao government release detained government critics, investigate all cases of enforced disappearances, and provide adequate compensation to victims of land confiscation and survivors of a recent dam disaster, FIDH and its member organization Lao Movement for Human Rights (LMHR) said today. FIDH and LMHR made the call on the occasion of the 9th EU-Laos human rights dialogue, which is held in Vientiane today. At least 14 political prisoners remain incarcerated across the country. They include: Somphone Phimmasone, Soukan Chaithad, and Lodkham Thammavong, who are serving prison sentences of up to 20 years for their peaceful criticism of the government in relation to alleged corruption, deforestation, and human rights violations; pro-democracy activist Bounthanh Thammavong, a Laos-born Polish citizen, who is serving a four-year-and-nine-month prison sentence for a Facebook post in which he criticized the government’s policies and actions; and 10 villagers in Ban Yeup, Thateng District, Sekong Province, detained without trial since July 2017 for cutting down rubber trees to protest land confiscation. With regard to enforced disappearances, the fate or whereabouts of at least 14 individuals remain unknown. The 14 include: civil society leader Sombath Somphone, who disappeared in Vientiane in December 2012; two women, Kingkeo Phongsely and Somchit, and seven men, Soubinh, Souane, Sinpasong, Khamsone, Nou, Somkhit, and Sourigna, who were detained by security forces In November 2009; Somphone Khantisouk, the owner of an eco-tourism business, who was abducted in Luang Namtha Province in January 2017; and Ittiphon Sukpaen, Wuthipong Kachathamakul, and Surachai Danwattananusorn, three Thai monarchy critics living in exile in Laos who disappeared in June 2016, July 2017, and December 2018 respectively. Lao authorities have failed to conduct effective and impartial investigations into all of these cases. The collapse of the Xe-Pian Xe-Namnoy dam in Attapeu Province in July 2018 exposed the government’s slow, inadequate, and non-transparent response to the disaster. Despite the apparent severity and magnitude of the disaster, the government immediately sought to downplay the death toll and tried to block independent reporting about the disaster. In late January 2019, authorities eventually revealed that 49 people had been confirmed dead and 22 were still missing. However, activists and local villagers believe the death toll could be significantly higher, as the fate of hundreds of residents remains undetermined. Compensation and assistance awarded to survivors and families of the victims of the dam collapse has been thoroughly inadequate. In addition, despite the formation of two government-appointed investigation committees, no accountability for the disaster has yet been established. Reports also emerged of a lack of transparency and potential corruption on the part of the authorities in connection with the relief effort, particularly in relation to the procurement and construction of ‘temporary houses’ for survivors. Concerns also remain over the ongoing lack of compensation for communities whose land has been confiscated by the authorities to make way for the construction of the 417km high-speed railway connecting the Laos-China border town of Boten to Vientiane. In November 2018, it was reported that 94% of the land required for the railway had been acquired and that the project was more than 40% complete. However, as of January 2019 – more than two years after the start of the project – many of the 4,400 families affected by the railway construction had not received compensation for their loss of land, livelihood, and income. We can’t believe it has been 6 years already since the day Sombath Somphone was enforced disappeared. The days have gone by so quickly yet the pain and wait remain the same for the family and friends as if the days have not gone by. Memories and CCTV footages of the day Sombath Somphone was enforced disappeared 6 years ago showed the authority and the police were clearly involved in the incident. Six years later, the Lao government has shown no progress in the investigation and brought no one to be responsible. We can’t believe that Sombath Somphone, who once contributed so much to the Lao society and development for over 30 years, would be the name the Lao government tries to forget. 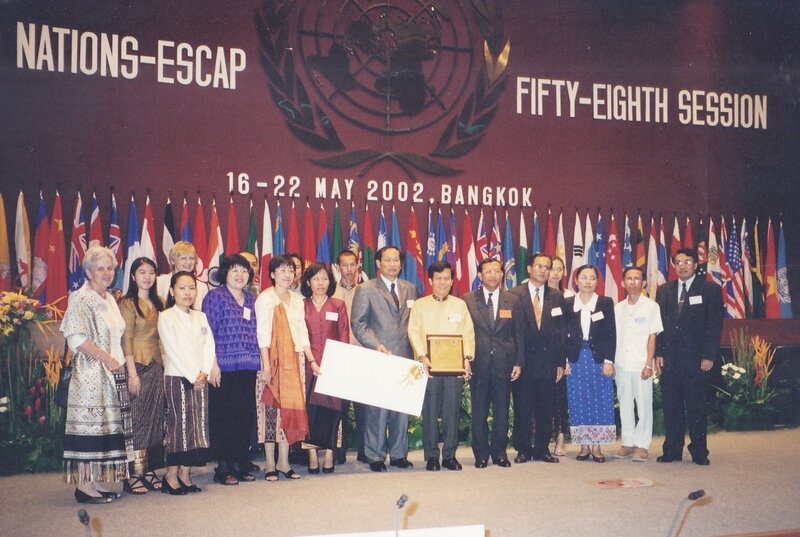 Uncle Bath, a prominent senior development worker, is renowned and respected by the civil society and development workers across Lao, ASEAN and the globe. Uncle Bath’s humble leadership was awarded the Ramon Magsaysay Award for Community Leadership in 2005 and many others by international organizations. His fruitful contribution to PADETC was recognized by the ESCAP Human Resources Development Award, given by the United Nations Economic and Social Commission for Asia and the Pacific (UN-ESCAP) in 2001. Anyone who has worked with Uncle Bath would recognize his charisma. For what Sombath Somphone has done all his life, it will not be that easy for the world to forget Sombath Somphone regardless of the the prolonged enforced disappearance and the Lao government’s silence and attempt to erase Sombath Somphone’s name. As time passes, his name slowly becomes a symbol of the Lao government’s mistake and failure. We, the young adults and youth of the Mekong Region, demand the Lao government to promptly resolved this issue for the Lao people and youth. It is time to free us from fear and doubts on the Lao government’s involvement in the enforced disappearance of our beloved uncle Sombath Somphone 6 years ago. We hope Uncle Bath is still alive and will soon return to his family. We hope he will spend the rest of his life with those he loves and love him. Uncle Bath shall be the symbol of integrity and happiness for the Lao people, towards a path of development based on the Gross National Happiness (GNH). Six years after his disappearance at a Lao police checkpoint, the wife of rural development activist Sombath Somphone called again on the Lao government to account for his fate, saying she has been kept in the dark despite government promises to investigate his case. “I am very sad that after six long years, I still have no news about Sombath,” Ng Shui Meng, a resident of Singapore, told RFA’s Lao Service in a phone call on Dec. 12. “It’s the same situation,” Ng said. BANGKOK: The wife of a prominent Laos activist who vanished after being stopped at a checkpoint on the streets of Vientiane said Wednesday (Dec 12) she “can’t move on” as the mystery over his fate remains unsolved almost six years later. Sombath was last seen on the night of Dec 15, 2012, with CCTV cameras capturing the moment when police pulled him over at a checkpoint in the Laos capital. He was shown entering a separate truck with two other men and driven off.